I’m curious, how do you feel about the holidays? Are you someone who starts their Christmas shopping in June and just can’t fit enough Christmas trees in your house? Or are the Holidays not your favorite time of the year? I admit to having slightly conflicted feelings about the holidays, Christmas especially. Many years ago we experienced a pregnancy loss on Christmas Eve, and I spent that day in the hospital. While it made me ever so grateful for the things about Christmas that you cannot buy, I admit that it did put a bit of a damper on the holiday for a few years. One of the things that I love to do at Christmas is make family memory albums. 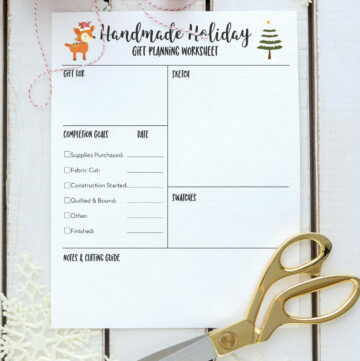 It helps me to remember all of the happy, wonderful parts of the holiday, and my kids and I enjoy looking back at how our lives have changed over the years. I know that even with all of the stress and hustle bustle of Christmas, what’s really important are the memories that we make with each other. It’s one of the things that helps me to celebrate the good at Christmastime. You can see some of my past albums here and here. I want to keep those memories, not just in my head but written down and documented somewhere for my kids to see when they are old and grown. 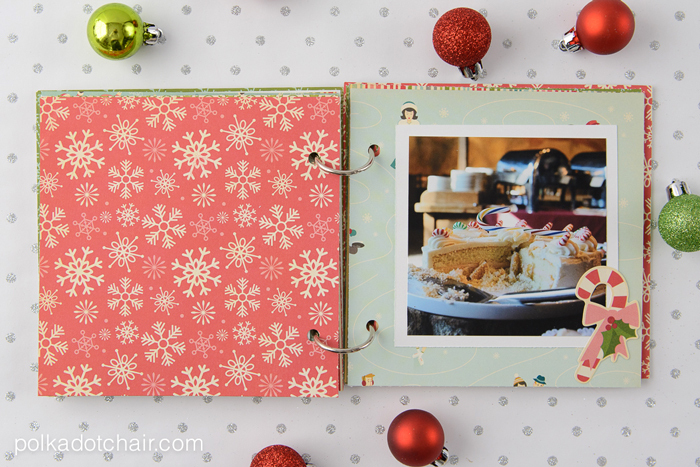 Making a holiday memory album doesn’t have to be complicated and is actually really fun! So…people, get those photos off your phone! Print them and put them out somewhere for everyone to enjoy. 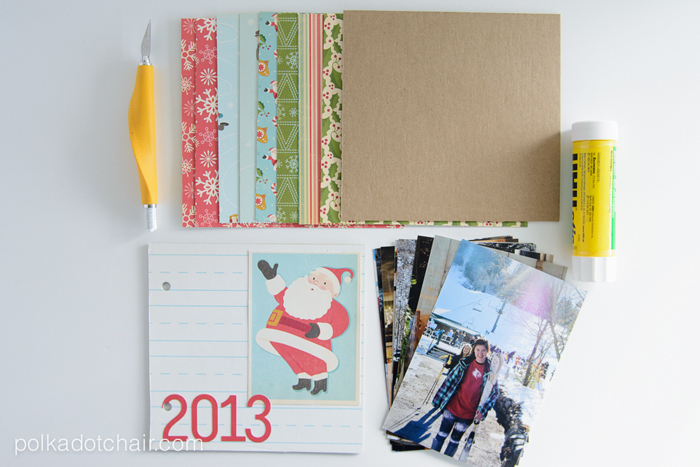 Today I’m going to share with you a very simple tutorial for making a family memory album. 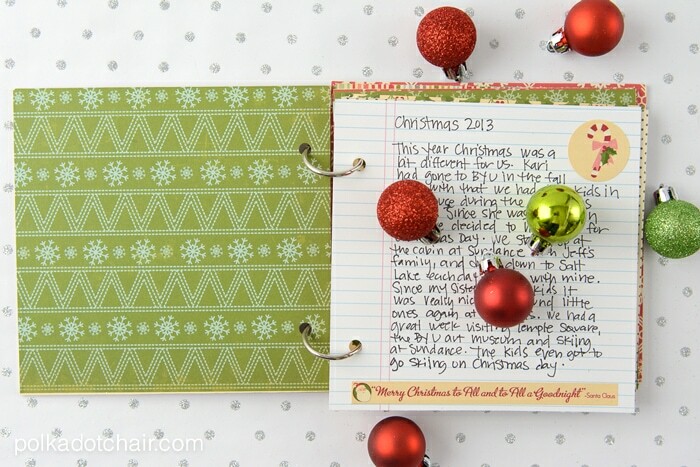 You can embellish it more if you like or just take the idea of a Christmas memory album and do it in a way that works for your family. 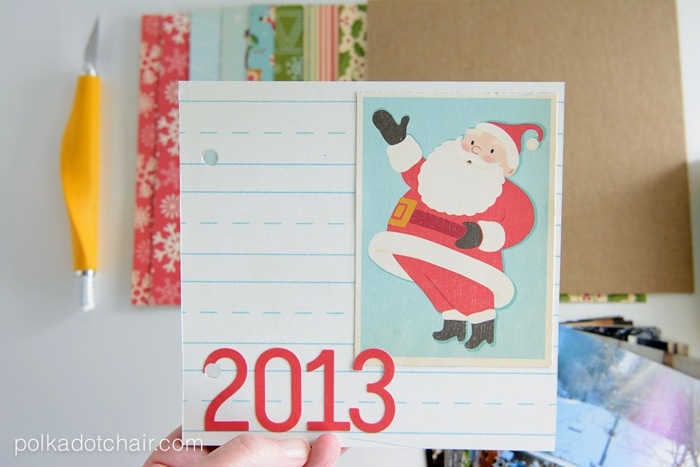 several pieces of 6″x6″ scrapbook paper, plus four 6.5″x6″ sized pieces for the front and back covers. 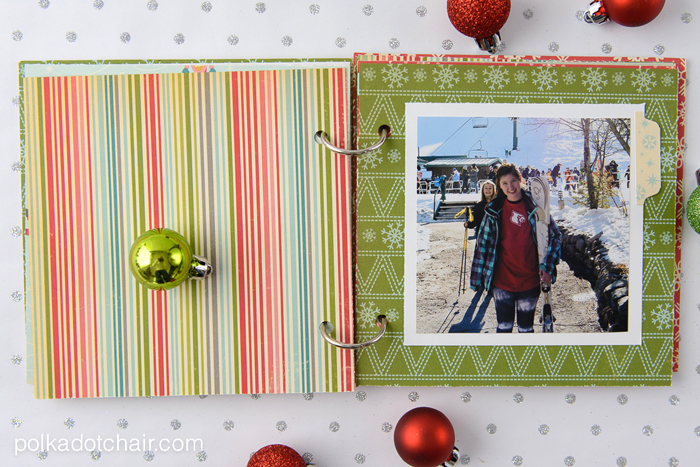 Binder Rings Photos trimmed to 4″x4″ (or just print your Instagram photos, as they are already square). 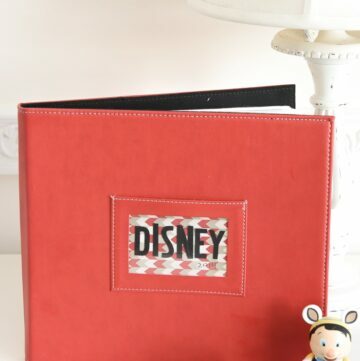 To make the front and back cover of the album, just use a glue stick to glue the scrapbook paper to the front and back sides of the chipboard pieces. 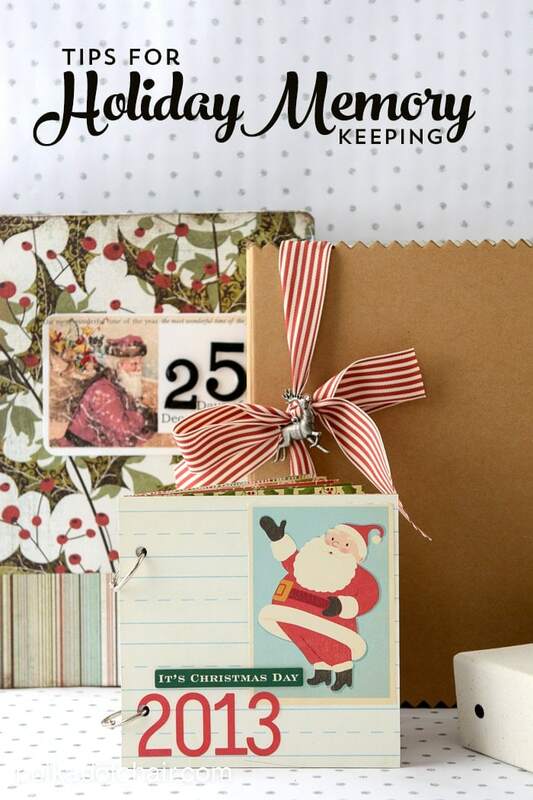 Use your X-Acto knife to trim off any excess paper from the chipboard. Then punch two holes in the front cover. Use these holes as a guide and punch the back cover and the inside pages all in the same place. 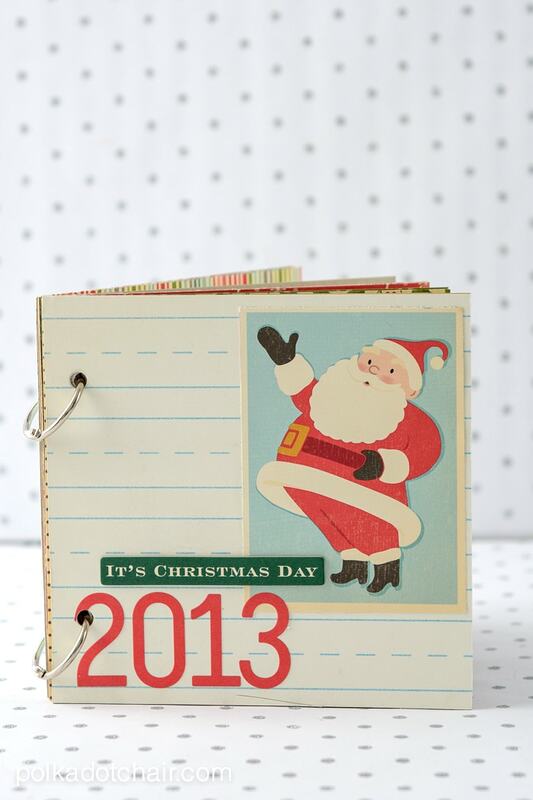 Now just glue the photos onto the white cardstock squares and then glue those to the inside album pages. Easy peasy. You can embellish as you like and use as many photos as you want. I included a journal entry as the first page of the album, and then left the rest just for photos. New York Life (@NewYorkLife) wants to help everyone remember to celebrate the good this Holiday season. Tweet your favorite Holiday memory or tradition and use the hashtag #KeepGoodGoing and #FeedingAMillion and they will donate 25 meals to Feeding America. Lets celebrate and bombard twitter with happy holiday memories all season! Don’t tweet? Visit New York Life’s website and upload a photo of how you #KeepGoodGood during the holidays. In addition to the donation to Feeding America, New York Life is giving away a $50 gift card and a $50 donation in the winner’s name to Feeding America on behalf of BlogHer. For a chance to win, tell me about a holiday tradition your family celebrates! *Through 1/9/15, New York Life will donate $2.50 for each approved post, with a minimum of $25K & a maximum of $100K. See full terms and conditions at NewYorkLife.com/CelebratingGood. Find info about Feeding America at feedingamerica.org. We decorate the tree the weekend after Thanksgiving and go to a local farm to look at their Christmas light display. A holiday tradition we celebrate every year is getting together to all go sledding here in Michigan. My kids and I enjoy decorating the Christmas tree together. I love Christmas. I always decorated the entire house with my hubby’s help. We have only had one big tree since 2006. We were moving in 2007. I was delayed 18 months going home from the military. There won’t be one this year because our kitchen is being gutted and our master bath is partially gutted. When this is all done I will go back to Christmas crazy. I had a daughter on a cold Christmas Eve morning almost 41 years ago. We celebrated her birthday day on Christmas Eve. Then had our Christmas om Christmas. She’s still spoiled from those days but it’s not her fault she arrived on December 24th. She made a great gift for my grandparents who celebrated their 50th wedding anniversary on Christmas Day. I love Christmas. I need room for all my decorations. We love Listening to Christmas Music! We all love getting together making hot chocolate and driving to the Tree Farm to pick up our Christmas tree. We love driving around our town looking at all the light displays-and we have so much fun making our Holiday Cutout Cookies! We setup the Christmas tree with holiday music playing on the first of December. We have a lot of traditions. Every year we get a real Christmas tree and decorate it while listening to Christmas music. We also decorate a gingerbread house every year. Picking out Christmas trees at a local farm and cutting them down together. We all get together on Christmas Eve, watch movies and exchange orniments and pj’s. Our daughter’s b-day is in December, so right after her party, after family and friends leave, we always decorate the house together for Christmas. Then we have all of our family over again for Christmas Day lunch. We decorate for Christmas on the Saturday after Thanksgiving. Break out the hot cocoa and xmas music! A holiday tradition that my family celebrates is baking gingerbread and sugar cookies together. We read Scripture before opening our presents as a family. we purchase same pj every Christmas and take a silly photo. Setting up our Hummel Nativity we bought in Germany many years ago. Our favorite holiday tradition is to make Christmas cookies together while listening to Christmas music. We always choose a “wish” off our local giving tree to fulfill for a child or elderly person. OUR FAMILY TRADITION CONSISTS OF DECORATING THE TREE & COOKNG THE MEAL TOGETHER! come home, drink eggnog and open one present. We love to bake cookies together as a family! Christmas morning we bake cinnamon rolls and play holiday music as we open our socks. Christmas Eve we viit friends then come home to yummy Greek Stew! We bake lots of cookies and pass them out to our neighbors!! We bake tons of Christmas cookies every holiday season. When the children were young we had fun with making Christmas cookies, driving around to look at lights and decorating. Now that they are adults I don’t really do anything special. I don’t decorate and the children have developed their own traditions. Our family tradition is making Christmas cookies and decorating them. My favorite tradition is having a treasure hunt on Christmas morning for the kids. We leave clues around the house they follow to find their big gift. Get a handful of friends together and go caroling. One of our family traditions is the we go to Mass on Christmas eve and meet up with my brother and his family and my Father. We’ve done this for years and after mass, everyone comes to our house for a light dinner. When our extended family gathers on Christmas Eve, the youngest child places the baby Jesus in the Nativity Scene. We go out for a Denny’s dinner after mass on Christmas Eve. We put up the Christmas tree the day after Thanksgiving, and baking & decorate sugar cookies with the kids. Every year I take a pic of the kids and let them make an ornament out of it! Fun! We take a name from the sharing tree and donate a gift to a child every year. We bake Christmas cookies with the kids and give some as gifts to those who don’t bake. We open one present on Christmas Eve and we have a ham dinner on Christmas. We have a Christmas Eve dinner for 14, a gift opening in the morning, brunch and then open house Christmas dinner for 20-25. Our favorite tradition is seeing a Christmas play or show each holiday season. We make and decorate Christmas cookies. We cut down a tree in the woods and decorate it together. On Christmas morning, we put a lit candle in a cupcake and we place it in front of the manger and sing Happy Birthday to baby Jesus. We have a traditional Christmas dinner with the family. We usually have our Christmas two to three days early, as our sons travel to other relatives on Christmas Day. My husband and I go out to dinner on Christmas eve. We go around and look at Christmas lights at a local park that sets up lots of lighted displays for a walking tour. I love our tradition of decorating our Winter Solstice tree with nature themed ornament and lights that look like snowballs. Bringing nature inside our homes for a month always makes me appreciate the Solstice even more. We like to bake cookies throughout the season. We love to bake Christmas cookies every year. We attend Christmas Eve church service together every Christmas Eve. Our family gets together for a family dinner of traditional foods and we watch holiday movies afterwards. We celebrate Christmas and Thanksgiving.